Consider the opportunities available for prime ministers to leave lasting legacies, and why artists respond to political leadership even long after a prime minister has left office. Resources include an artwork by John Frith and a biography of John Christian Watson. What is a reform flask and why is this one in the shape of Prime Minister Chris Watson? What is a reform flask? What were some of the reforms Chris Watson was best known for? 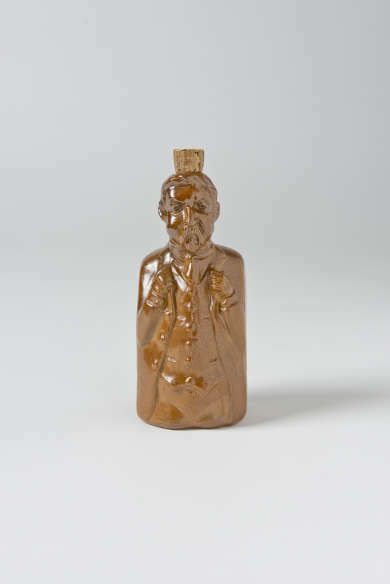 What message is the artist offering by depicting Chris Watson in the form of a reform flask? Do you believe it is important to have a society where artists can freely express their opinions? Write an opinion piece about how Chris Watson's early experiences may have influenced his priorities during his time in public life. Have you ever collected merchandise or souvenirs relating to famous people or places? Design your own collectable object for the current prime minister, or a former one. Consider how the materials and form of an object affect how you understand or relate to it. Also, consider what the design of your object can reveal to others about your opinions and views.